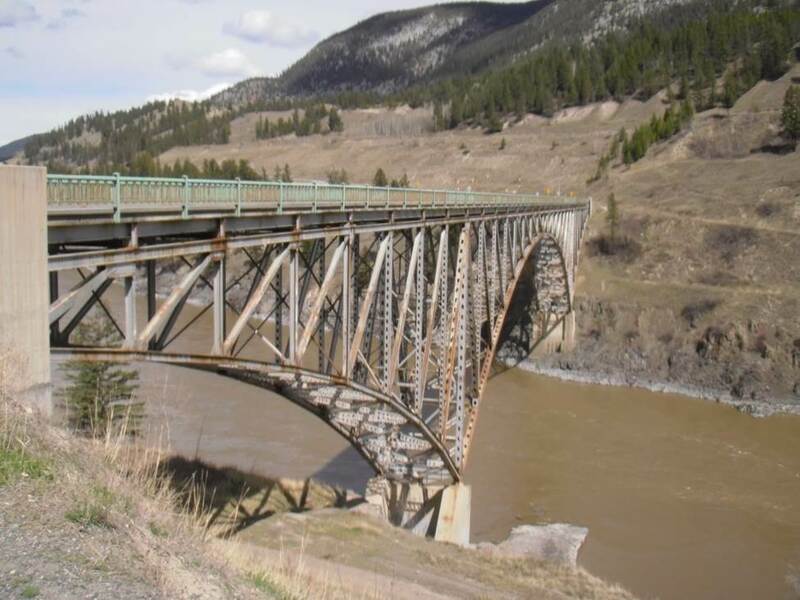 Dry Gulch Bridge on BC Highway 5 is a steel arch bridge. According to the dictionary, a bridge is: “a structure carrying a road, path, railroad or canal across a river, ravine, road, railroad or other obstacle”. That’s a basic and accurate description of a bridge to be sure, but here at the Ministry of Transportation and Infrastructure, we think of bridges as something more than just a structure crossing a span. We think of bridges as a special type of infrastructure. Bridges inspire. Bridges open possibilities. Bridges connect. To us, bridges are a pretty big deal. Because British Columbia is so geographically diverse and because bridge engineering evolves over time, you will see a variety of bridge types being used in BC. In order to span a crossing, a bridge must have support. That support system can be above or below the bridge deck. Bridges can be constructed out of steel, wood, metal or concrete or a combination of these materials. 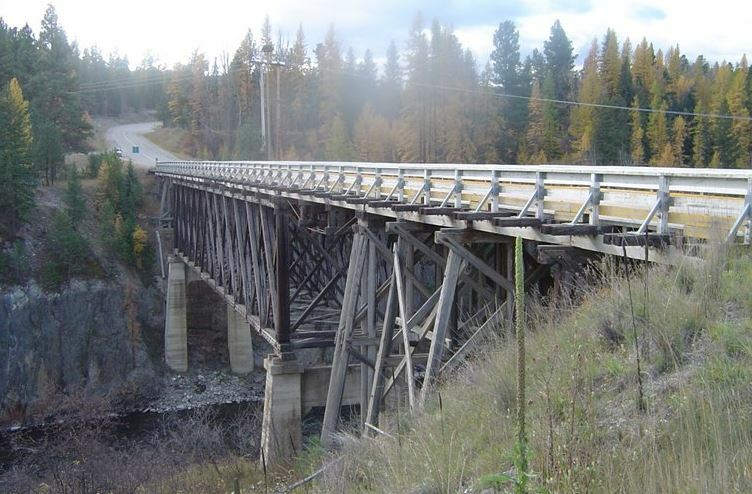 With these basic ideas in mind, we would like to introduce you to some general types of bridges used in BC. This is a type of bridge in which the weight of the deck is supported by vertical cables suspended from larger cables that run between towers and are anchored in abutments at each end. Hudson’s Hope Bridge is a beautiful example of a suspension style bridge. 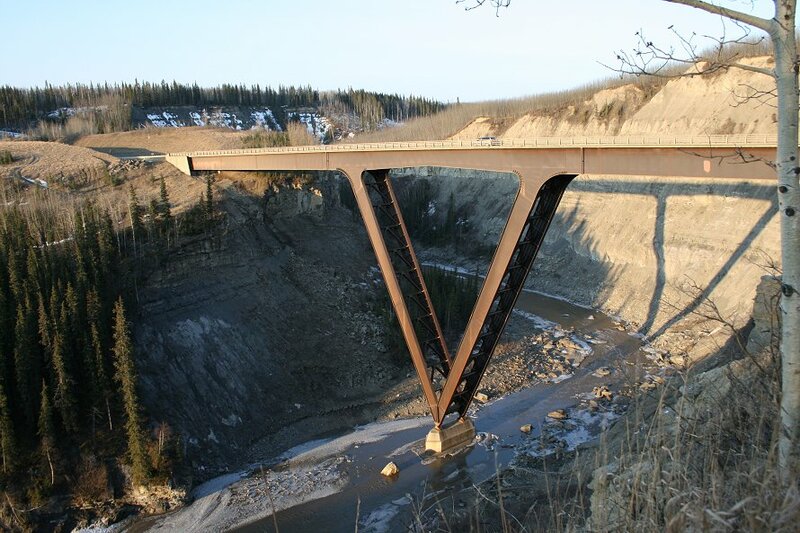 Built in 1964, this bridge is located on Highway 29 west of Fort St. John. Suspension bridges use cables to support the bridge deck along the span. Built in 1938, the iconic Lions Gate Bridge is the most recognizable bridge in BC and another excellent example of a suspension bridge. A truss is a structure built out of tension and compression sections. These sections are arranged in triangular patterns to provide strength and stability. A truss bridge is a bridge with a load carrying superstructure made of trusses. Truss bridges are generally made from either steel or timber or a combination of both. Trusses can be presented on top of the bridge deck (a “through” truss) or under the bridge deck (an “under” truss). 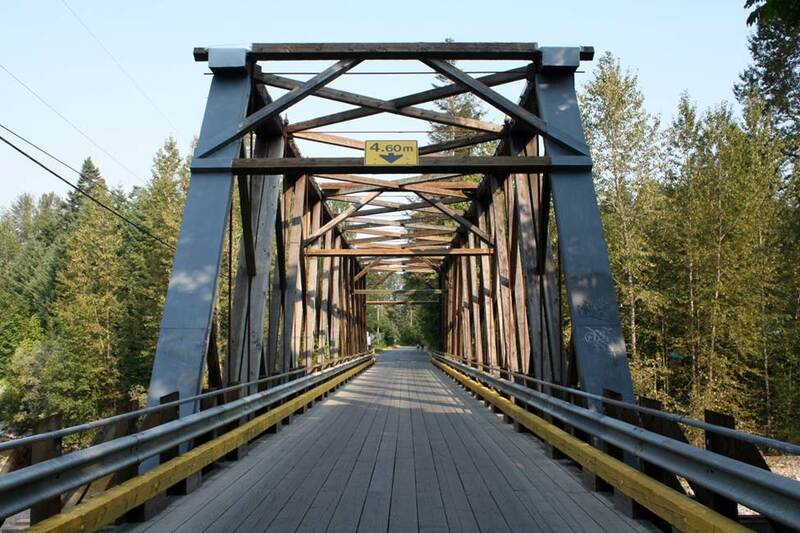 The Oyster River Bridge near Campbell River on Vancouver Island is a timber “through” truss bridge. Basically, this is a bridge with a timber truss which you drive through. The Bell Irving River Bridge is a steel truss bridge. Like the Oyster River Bridge, you drive through the trusses, but in this example, those trusses are constructed of steel instead of timber. If you look closely at this image, you will notice that this bridge has a metal deck used to reduce the weight of the bridge. The Bell Irving River Bridge was constructed in 1967 and is located about 100 km north of Cranberry Junction on Highway 37. 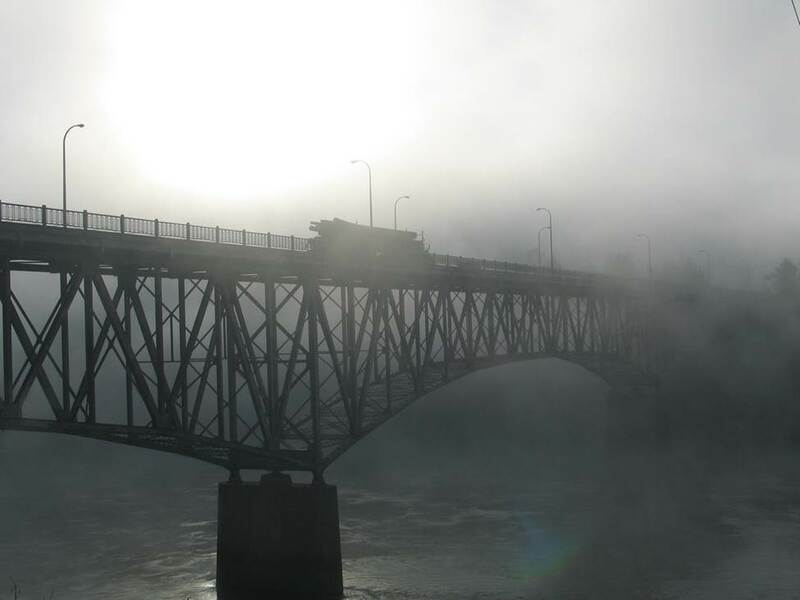 The Simon Fraser Bridge, built in 1963, is a deck over steel truss bridge which with an arch shaped bottom profile spans the Fraser River in Prince George. It was twinned with a second bridge in 2009. 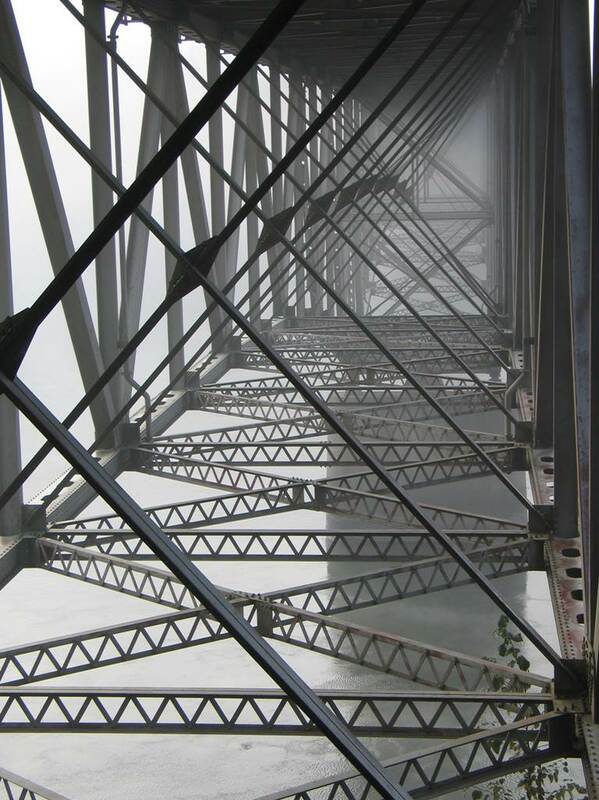 An interesting and artistic perspective of the steel “under” truss of the Simon Fraser Bridge. St. Mary’s Wycliffe Bridge, built in 1931, is a lovely example of a timber bridge with trestle spans and a deck over a timber truss support. Are steel or concrete bridges constructed in the form of an arch or arches, typically with concrete abutments. Big Qualicum Bridge is concrete arch bridge with concrete girders located along Highway 19 on Vancouver Island. Dry Gulch Bridge on Highway 5 is a steel arch bridge. Chilcotin BridgeLike the Dry Gulch Bridge featured above, the Chilcotin Bridge (located in the Cariboo region) is another classic example of a steel arch bridge. Unlike Dry Gulch Bridge, this arch uses a truss configuration. 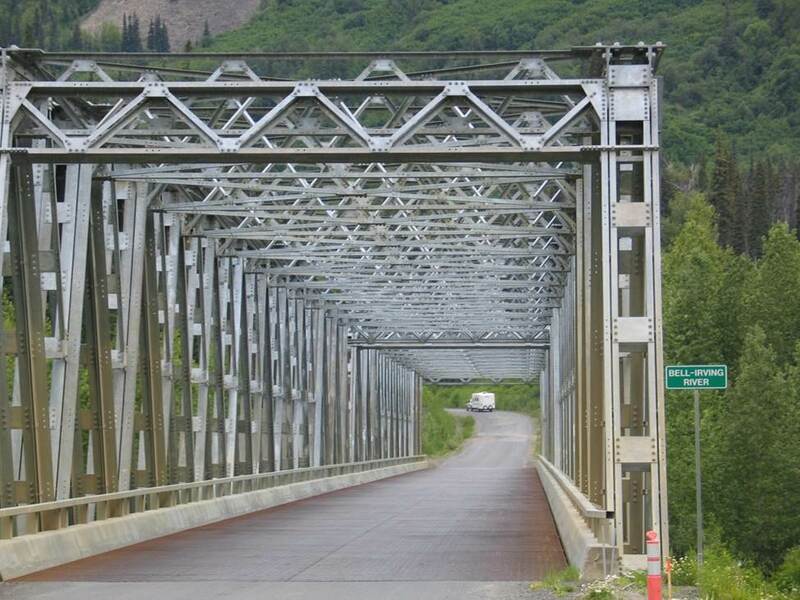 The Culliton Bridge is a tied steel arch with the arch above the bridge deck. Built in 1983 it is located on Highway 99, also known as the Sea to Sky. A cable stayed bridge has one or more towers from which cables support the deck. 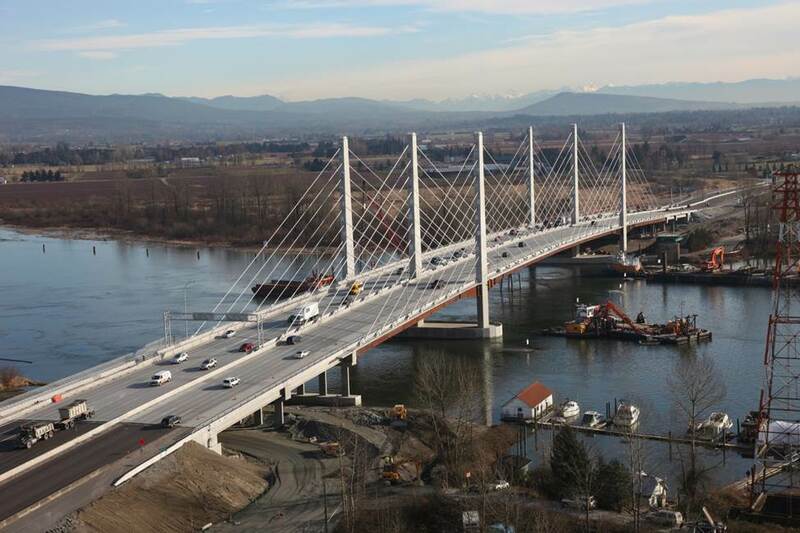 The Pitt River Bridge, constructed in 2010, is an elegant example of a cable stayed bridge. 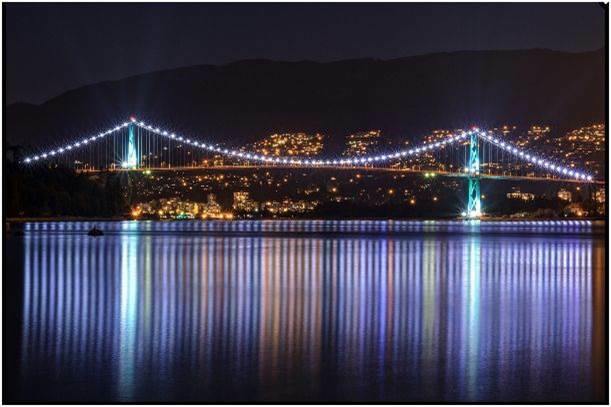 Other examples of cable stayed bridges in B.C. include the new Port Mann Bridge and the Alex Fraser Bridge. All three are located in the lower mainland. A bridge constructed with wood, steel or concrete girders. 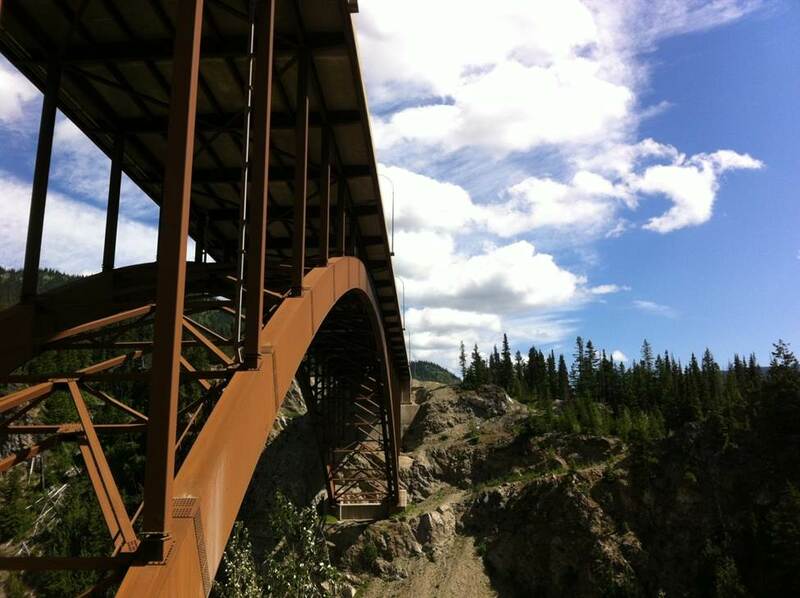 The Park Bridge (the inspiration for our TranBC logo) is a curved steel girder bridge on concrete piers. Constructed in 2007, it is located on BC highway 1 between Field and Golden. 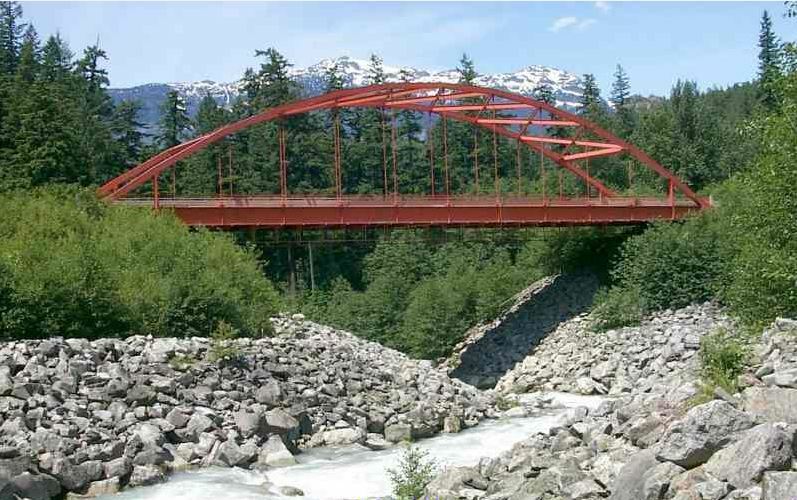 Another type of bridge which often goes unnoticed but is actually a very common bridge type in BC is the overpass. 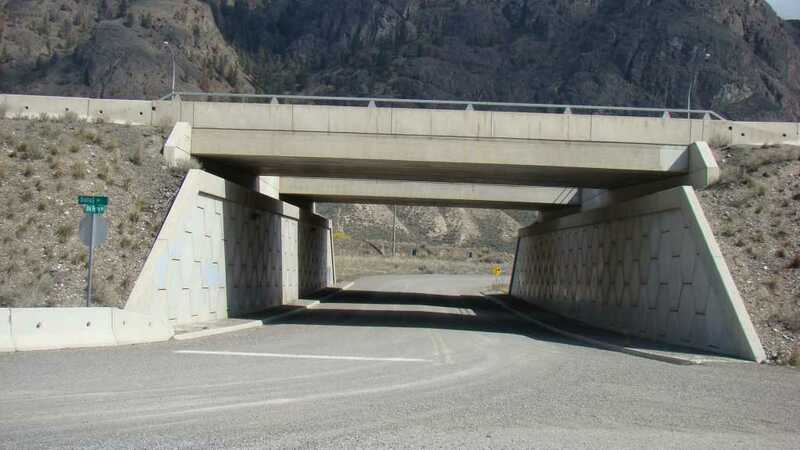 This is the Bostock Road Overpass, located on the Trans-Canada Highway in Kamloops. 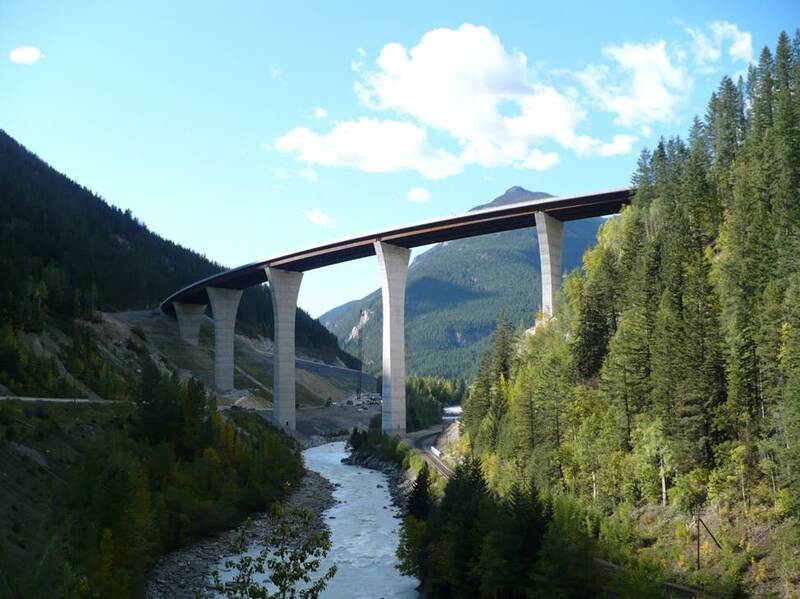 This bridge is made up of pre-stressed concrete box beams and supported on mechanically stabilized earth wall abutments. This stunning structure is called Kiskatinaw Bridge. 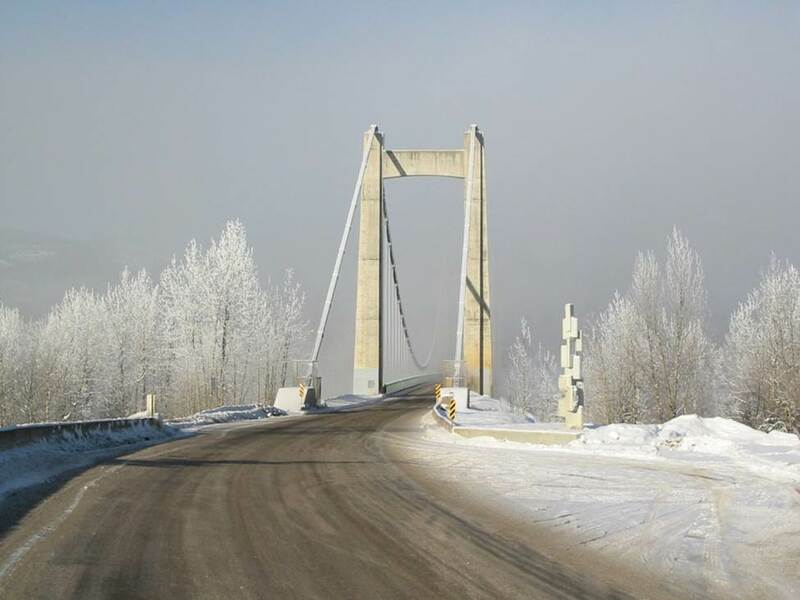 Located in the Peace region, it is a steel frame bridge built in 1978. 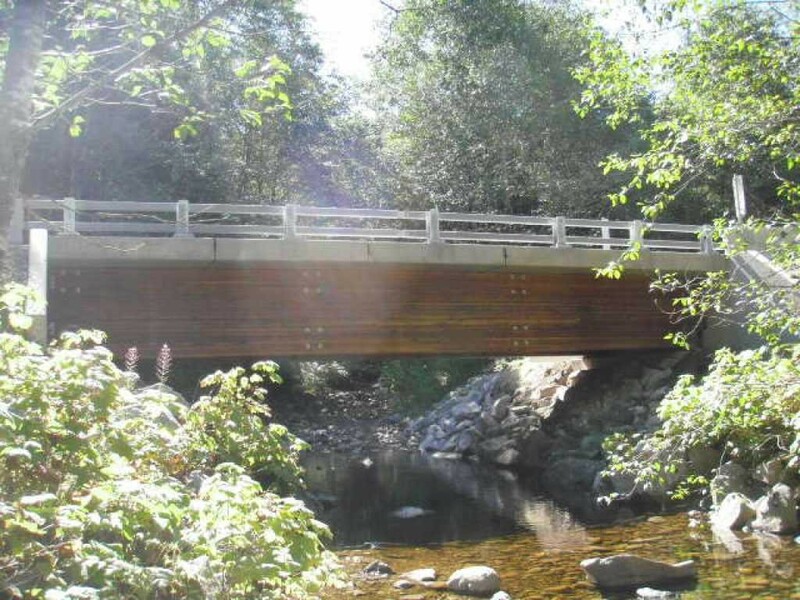 Built in 2010 on Vancouver Island, Large Creek Bridge is constructed out of glulam timber girders. Glulam is glue laminated timber, a structural timber made out of a number of layers of timber bonded together with durable, moisture-resistant adhesive. These bridges are sometimes called pontoon bridges and they really do float. 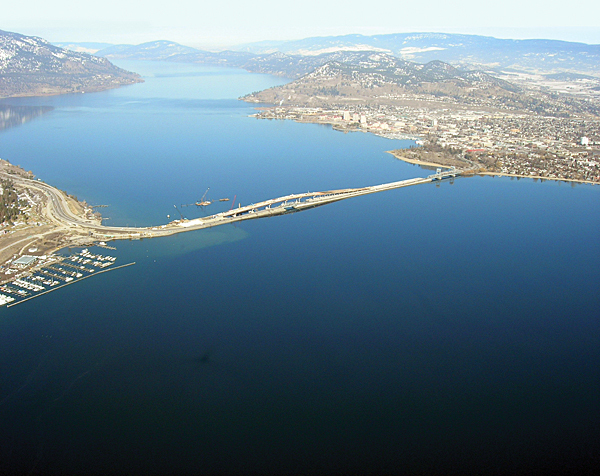 The William R. Bennett Bridge on Highway 97 across Okanagan Lake was completed in 2008 and is one of only a few floating bridges in the world. The crossing is about 1060m long of which 700m are on floating concrete pontoons. The structure has five lanes plus an elevated span to allow passage of marine traffic. So, now you know some of the basic types of bridges in British Columbia, you can amaze your friends and family with your new found knowledge on your next road trip. Looking for more information on a bridge, or type of bridge which we didn’t cover here? Let us know in the comments below. Our records indicate that the Oyster River Bridge was built in 1967. Hope that this helps! How about picture of Little Qualicum Bridge in Highway 19A, Same of old Malakwa bridge. Thanks for your suggestion Harry. Another try to pinpoint the ‘coke’ bridge question; is it near the ‘coke’ Summit sign. I saw the Summit sign but could not stop to get a picture of it – happened upon it too suddenly. It is just passed the summit, heading north. We have sent a snapshot of the bridge sign and approximate location from Google maps to your email. Hope that this helps! Thanks for the reply but I’m not familiar with your GPS answer of the Dry Gulch bridge location so please re-answer my question where the location of the bridge is, in simple English, thanks. The bridge is just past the Coquihalla summit, south of Merritt. Hope that his helps. Before the exit for the 97C? Ok, and thank you for all the answers. I drove the bridge and didn’t even know it. Maybe an idea would be is to place a sign or something to draw attention to it. I could have stopped for some pictures of it. But no matter, I had a wonderful and extraordinary first time visit to BC. The view of the Milky Way from the Hope Slide rest area was the most awesome, magnificent site I have ever seen in the night sky. It was like I could reach up and touch heaven – it was that brilliant to see. Thank you God for allowing me to view part of your creation and thank you Canada for allowing me to see part of your beautiful country. I absolutely want to come back. Glad to hear you loved our beautiful province Mark. I too have seen the Milky Way along BC Highway 3 and will never forget it. And thanks for the suggestion about the bridge, we will share that forward with the local area manager. Great questions and thanks for connecting with us to ask them! Dry Gulch Bridge is located at 49° 36′ 58.25″ N 121° 2′ 44.17″ W which means that you must have passed right over it on your trip. The bridge deck belies the beauty of what is found underneath to be sure. And we agree, the Coquihalla, or “the Coq” passes through some of the most beautiful scenery in the world! Part of that beauty is due to the fact that the Coq passes through a high mountain pass making it susceptible to sudden weather changes and at times intense snowfall. When you couple that weather with drivers from the Vancouver area who are not always used to driving in the white stuff, things can get a little tricky. We have created a number of pieces of content for the public to help them better understand the steps they need to take in order to travel the Coquihalla safely. Again, thanks for connecting with us here and if you have any other questions about these or any other BC transportation issues, let us know. 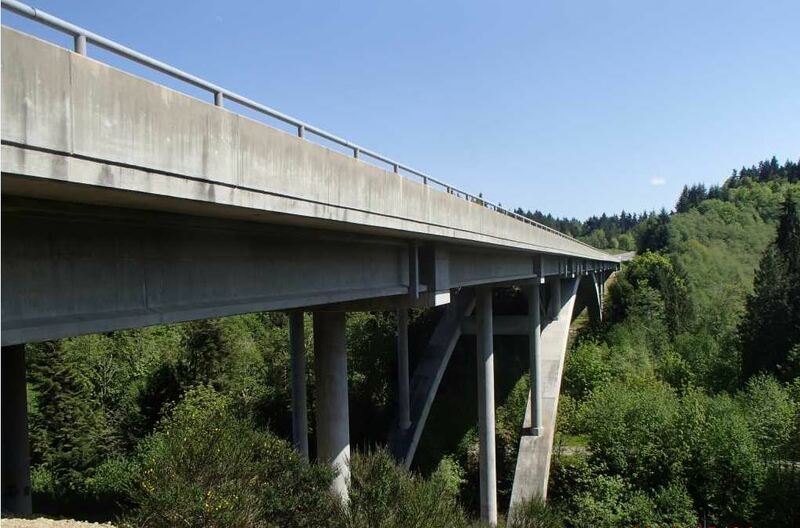 Isn’t the Big Qualicum Bridge you show above, on Hwy 19 (the “new” Inland Island Highway)? Route 19A is the old Island Highway. Good catch. This bridge is on 19, the new Inland Island Highway. Glad to hear you liked the blog! I wonder why you only mention the newer bridge in Kelowna, but not the old one it replaced (also a floating bridge) which had merits of its own. Also, why such an old picture of the William R Bennett bridge? the image used, where the new floating bridge is under construction and the old one is still visible (and in operation), is a bit confusing to look at. I run a Facebook page based around the town of Chemainus and we are having a discussion on when the TCH bridge over the Chemainus River (near Mt Sicker Road) was twinned. We have the date of the original bridge as 1950, now the mystery is on the new twin and when it was built. Any help is appreciated. Thanks for connecting with us here. Chemainus River Bridge (East) was constructed in 1980 and you are correct, Chemainus River Bridge (West) was constructed in 1950. 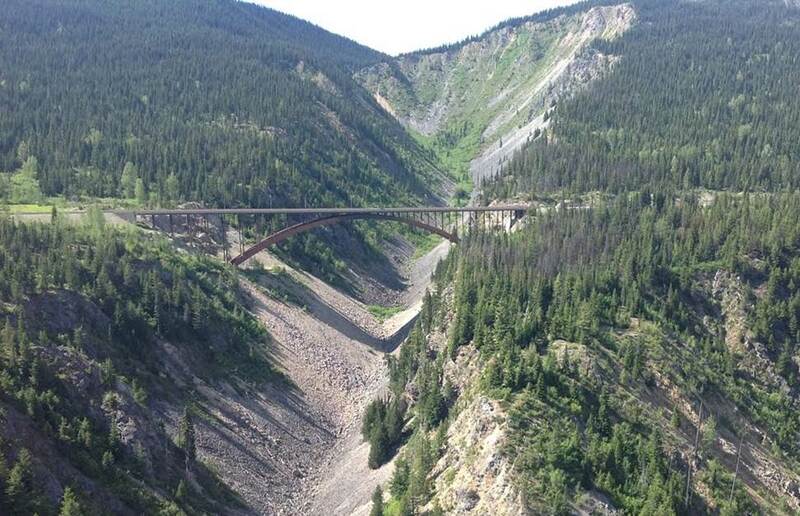 Another bridge I’d nominate is the CPR’s Stony Creek (Steel Arch) Bridge, just east of Rogers Pass. PS the Park Bridge is actually between Golden and Field, BC. Glad to hear you like them and what great insight about bridge design and location. P.S. Thanks also for the heads up on the location. The Kiskatinaw Bridge looks really cool! I’d be really interested to find out more information on it! It is a beauty, isn’t it? Anything in particular you would like to know? Hudson Hope is west of Fort St. John, not north.